It is interesting to observe the following: a) The evil effects of drinking powerful bid'ahs, such as the one in which Uthman is accused of instituting bid'ah into the deen of Allaah, upon the heart, mind (intellect) and soul. b) The method of operation of the Hajurite machinery. Pay attention to how they change the goalposts, disseminate a lie to pave the way for others to come along and build on top of that lie. 01. First, the Hajurites tell lies in order to accuse their opponents of telling lies. This lying Haddaadi who "desires to make tabdi of Uthman (radiyallaahu anhu) (see here)" and persists in a view (after the hujjah is established) for which the Major Salafi Scholars have made explicit tabdee' (see here) has stated "Haajori and his followers sympathetic to ISIS? Why lie?" The Haddadi Hajurites of Netherland retweeted this statement. As we established in previous articles, Haddadis like Musa Millington are braindead (due to the effects of bid'ah) and nowadays they are left with nothing except to troll online. In the PDF article it was stated that a) The Extremist Haddadi takfiris like al-Ghamidi, al-Zakuri, al-Munasarah and their likes have sympathies and connections to the Kharijites of ISIS and b) That some of the Hajurites of Netherlands have connections with these extremist Haddadi takfiris and that they also have sympathetic opinions or positions towards them. 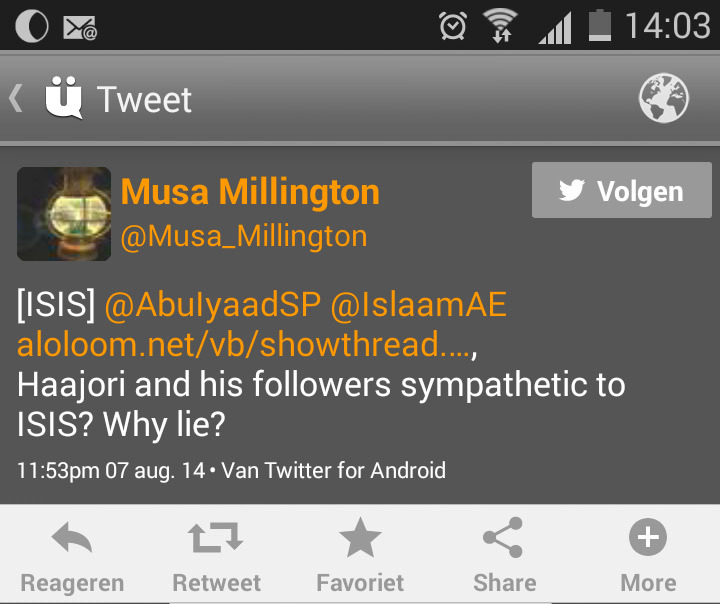 However braindead Musa Millington has stated "Haajori and his followers sympathetic to ISIS? Why lie?" - and this is the way of these evil Haddadis. We did not mention that al-Hajuri himself is supportive and sympathetic, but some of the Hajurites and more specifically the Dutch brand. But this is the way of the Haddaadis, and this is actually a characteristic of all of their defences of al-Hajuri. They change the goalposts, tell lies, distort the facts, and anyone who is not clued up will be taken in by their lies and think that they are the victims and are being oppressed, when in reality they are the greatest of conniving liars. 02. On the back of the above, we see other Hajurites come and build upon it to develop the lie further. Now the following Hajurite slipped through the next, he did a quick follow and made a burst of twenty or so tweets. Normally, these people are blocked immediately (the Hajurite has now been blocked). But lets take a look at this round of bullets. You have to read from the bottom up, in reverse order. We see there are two issues he raises. The first is about the adhaan of Uthmaan and he is raising some doubts about this that hold no value. That is not what we are really concerned with. What we are more concerned with is how the lie propagated by the first Hajurite, Musa Millington, is then taken and developed further. 03. This second issue is the allegation of accusing Yahya al-Hajuri of supporting or being sympathetic to ISIS. And of course this was never true, ever. Rather, what was stated in the PDF article was that there are some Hajurites, specifically from Netherlands who have shown sympathy towards the ISIS Terrorists and that they have leanings towards the extreme Haddadis (like al-Juhanee and others) from whom there are sympathies and connections with those ISIS Kharijites. Then when this was challenged, we brought the evidence (right here). However, the Haddaadiyyah have developed the trait of lying and twisting extremely well - as this is common throughout their attempted defences of the bid'ahs of al-Hajuri - and we see Musa Millington twisting what was actually said to mean that al-Hajuri (along with his followers) was accused of supporting ISIS. On the back of this distortion, comes another Hajurite and takes this further. This is how they work. And what happens is that due to rapid propagation of this lie (the lie they used to claim al-Hajuri and his followers have been lied upon), it appears to an onlooker who does not bother to verify further, that these people are being slandered and lied upon. When in reality, that is not the case. 04. What has happened is that the evil effects of that potent bid'ah which they have been drinking has intoxicated them so much that the faculties of hearing, seeing and understanding become compromised and they do not fully grasp what is being stated. Then in that intoxicated state, they fire away tweets or posts, and through that initial distortion, a whole thread is developed upon it and the original, accurate statement that was made in the first place is deliberately buried deep (through further misdirection) so that an onlooker who comes along and sees only the frenzied activity of the Hajurites in this matter does not see the realities, because the goal-posts have been changed and the issue altered from what it actually was. This is how the Hajurite machinery works. It is founded upon the chassis of intoxicating bid'ah and the engine is pushed with full acceleration through the foot of misguidance such that the vehicle is moved to an altogether different location, far away from the first, so that the onlooker is turned in a totally different direction to where he should be looking (for the original issue and statement).